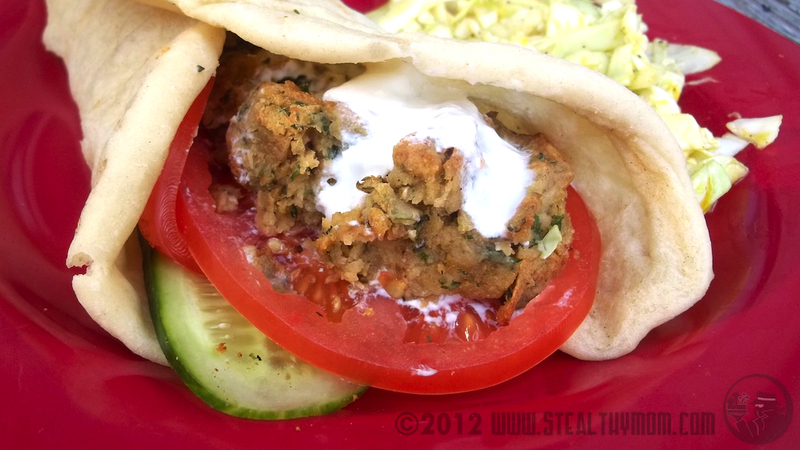 Falafel could be the original "veggie burgers." A tradition from Middle Eastern cuisine, falafel are generally deep fried to give them a crispness outside while staying tender inside. You can achieve that on the grill, too, making this a fun burger for cook-outs. I adapted this falafel recipe to make it gluten and egg-free. Our boys really enjoyed these. The Cadet helped mix the seasonings and blended chickpeas together. G-man, who often claims to dislike chickpeas, dug into the final product with enthusiasm. When the older brother exclaimed that he liked these "burgers," the little brother declared that he liked them too. Thumbs up! Blend the chickpeas and onions together, either with a blender or food processor. Mix the dry ingredients together in a bowl, then add the chickpea mixture. Stir it all together to make a paste then pop it into the fridge for at least an hour to set up. With an ice cream scoop, make balls of falafel paste and set aside on a pan. [Pre-forming the patties and placing them on a pan slathered in olive oil sounded great in practice, but was a waste of time because the patties got a bit mucky with the oil.] Take the falafel balls to the grill area. Bring along some olive oil. Cook the falafel on a cooler grill: 350-400F. Wait until the charcoal is white with ashes, or adjust the propane grill until you get the right temperature. Be sure to close the lid to make the grill into an oven. Pour some olive oil into your hands to coat them. Gently take each falafel ball into your hands and slightly flatten them, about an inch thick. Place them on the grill. Close the lid to let them bake. After about five minutes, test a patty to see if you can flip it. If you can- using a spatula and tongs if yo need- flip them. After about five minutes again, flip them again. Bake them, turning them over every few minutes, until they have a crust that you can tap. *I have not tried making these with fresh parsley or cilantro. Since fresh herbs would add some moisture, you will need to add some additional flour to compensate. Like this idea? I shared it with link-ups of natural food recipes with contributors around the world. Check out Meatless Mondays, Monday Mania, Homestead Barn Hop, Fat Tuesday, Traditional Tuesday, Slightly Indulgent Tuesday, Hearth and Soul Hop, Gluten Free Wednesdays, Allergy Free Wednesday, Real Food Wednesday, Frugal Days, Sustainable Ways, Thriving on Thursdays, Simple Lives Thursdays, Full Plate Thursdays, Fight Back! Fridays, the Weekend Whatever the Foodie Friends Linky Party, the Ultimate Recipe Swap and the Friday Vegetarian Potluck. I'm always looking for this type of recipe that isn't fried. Looks good. Thank you! Yum, your Grilled Falafel looks awesome! Hope you are having a great week and thank you so much for sharing with Full Plate Thursday. Hey, thanks! We aren't vegetarians, but choose meatless dishes more days than not. Looking to traditional recipes from other cultures has given me so many ideas. I made it to your blog! Your recipe looks really good! Thanks for sharing at Foodie Friend's Friday! Please come back next week and share another great recipe! How would I cook them if I didn't use a grill? Thanks! I think they are almost always fried. A restaurant might deep-fry them, while a home cook could cook them in an inch of hot oil, turning them part-way through. I've tried baking them but with limited success because they did not get a crust on the outside. Cast-iron baking pan, perhaps?